I love almost anything that has two wheels and a motor. There is just nothing like the feeling of jumping on a motorcycle or scooter and riding to…well…just about anywhere. My first love in that space was vintage Italian motor scooters, Lambrettas to be precise. From the first time I laid eyes on one, I couldn’t stop thinking about them–I was absolutely obsessed. 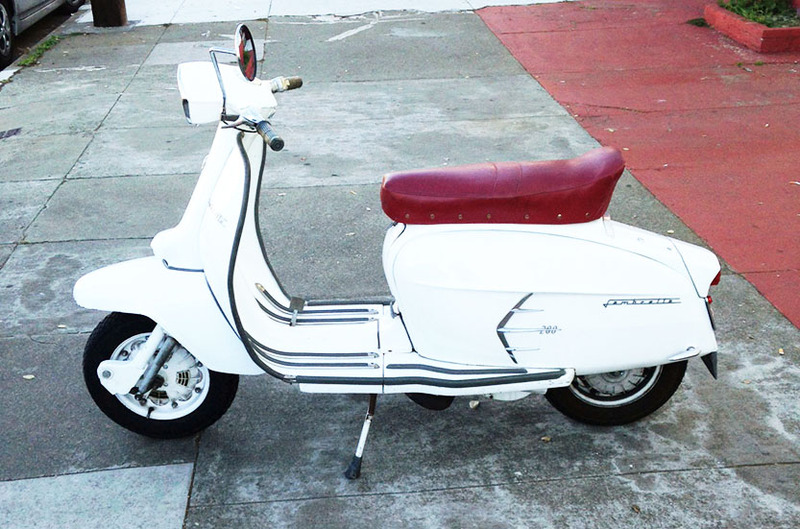 I bought my first one at 18, a 1979 Serveta LI 150 Special (a Lambretta made in Spain under license from Innocenti). Over the years I have owned quite a few examples. I would buy them, fix them and sell them and then repeat that process many times over. 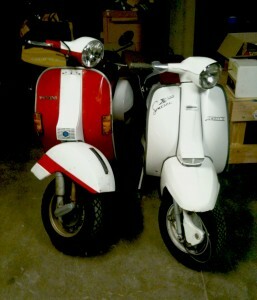 Currently, I have a 1979 Vespa P200 and a 1968 Lambretta SX200 (right). The design on these old scooters is undeniably cool. Good looks was a prerequisite of any vehicle made in Italy at the time–reliability on the other hand…well, let’s just say that wasn’t as much a focus. The result is that you have a beautiful thing that you work on almost as much as you ride. Even if you do a full, “nut and bolt” restoration, there will always be more to do. You lovingly build it up, polish all the chrome bits and set off on your way. When you first start out, you think to yourself, “Right, it’s finally finished!” Then you hear that weird rattle and need to pull over and tighten something up. Then you realize that your headlight bulb keeps blowing and you need to spend the afternoon tracing through the electrics to find what’s causing that. Oh, and let’s not forget the “regular maintenance”, which was quite a bit more regular than what today’s vehicles require. An adjustment here, a screw to tighten there and before you know it, the weekend you had planned for a leisurely ride is spent wrenching in the garage. In thinking about this, it occurred to me that vintage scooters are a lot like business. The work is never done. You build something and think it’s good to go. Then, once you start “rolling”, that’s when the real work begins. There will definitely be maintenance and there may be parts that need fixing or even total replacement. You will always be working to improve your performance (well, you better be anyway). Sometimes you may even need to cut your losses and start over. The truth is, it’s hard to envision how what you’re building in the garage does once it is out on the road. It changes things, much like how what you put together in your business plan, wireframes or prototype might take on a whole new life when they are released into the hands of your customers/users. The thing about scooterists–especially those that have been around for a while, is that we come to accept this as part of the experience. It isn’t a point of friction or frustration, it is the price of admission for owning these beautiful machines. In fact, most of us learn to love the journey of building a scoot from a bunch of bits in boxes almost as much as we love the shiny end product. We find the work meditative and often seek out new projects once the current one is finished.